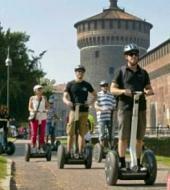 Have fun gliding through the wonderfull streets of Milan, the Econoic and Fashion capital of Italy on the coolest personal transporter of the 21st century. Gliding from The Sempione park to the Sforzesco Castle (Sforza Castle) to finally arrive in the gorgeous Cathedral Square where you can admire the Galleria dedicated to Vittorio Emanuel the 2nd , the king of Italy. Our groups are limited to a minimum of 2 and a maximum of 10 participants per tour. Needless to say you’ll have unique photo opportunities to capture the everlasting architecture of Milan. Our Tour starts with a 30 min orientation session at our premises. Once you feel comfortable riding the Segway we will start our journey to the Historic Center of town, here you will have the opportunity to visit all the important areas of our City while listening to your guide comfortably through your headphone set. • This tour will be confirmed once the number of participants has reached the minimum number (2 participants). Meeting point: Via dei Chiostri corner with Via Ancona, Milan. About 5 minutes walking from "Lanza - Brera" Underground Station.